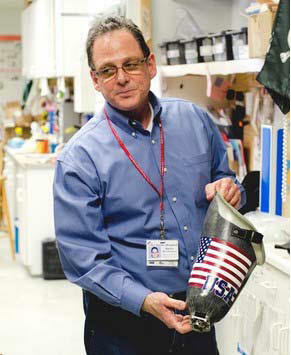 M. H. Mandelbaum Orthotic & Prosthetic Services, Inc. articles of interest. THE SHOTGUN BLAST tore through the shinbone of his left leg, relegating it to a bloodied mass of flesh and splintered bone. Peter McClinchy, all of 18 years old, was on the cold kitchen floor now and, as best as he could figure, as good as dead if he could not somehow call for help. The telephone, on the wall seemed hopelessly out of reach. And his Father? That was a good one. His father’s phone call and suicide threat were the reason he had come to the house in the first place. There was no chance his father was going to call anyone now, being unconscious and maybe intoxicated. In his mind, Peter McClinchy told himself, ” I got shot.” And then, realizing he somehow had shot himself, told himself, “Don’t pass out.” And so he crawled. Crawled them dragged himself. Through the kitchen, through the living room. Through the foyer an to the front door. Somehow, sprawled in the doorway, the chill of an October night and death staring him in the face, he managed to yell. He was shivering now – so cold, so cold – as the blood spilled out of him. Next door, at her house, his grandmother heard him scream. And then his aunt and uncle and grandfather and soon they were all there. Calling 911. The ambulance carried him from his father’s house on Elizabeth Place in Center Moriches to Brookhaven Memorial Hospital. From there, the helicopter airlifted him to the University Medical Center in stony Brook. The next thing he knew, a doctor was talking to him. “Once I stick this needle in you, you’re going to go out.” he heard the doctor say. It all seems so distant now as McClinchy sits in the dugout of the baseball field at Center Moriches. Seems so distant because McClinchy is a senior and a left-handed pitcher for the team. Seems distant—despite the fact that it is May 9 and this happened Oct.5–because he is talking about a game from the previous afternoon when he threw five innings in relief against Port Jefferson, losing on a wild pitch in the 10th. Losing after they started bunting on him. Distant, that is, until you look at the leg. It is right there, sticking out from under his shorts, $13,000 worth of hinges and springs and bearings and hydraulics, the graphite foot–just a curved shape really, but worth $7000 by itself—extending from a casing around his upper leg and tucking into his sneaker where his left foot once had been. “The first time I pitched I was pretty nervous,” he said. “Not because of the pitching, but because of the people watching.” That was March 28. He is fine with it now. “He said, ‘ I can handle that.’ That’s what he said, ‘I can handle that.’ “And since then, he has. Peter McClinchy has forgiven his father, Robert, who, according to Suffolk County police spokeswoman Cecelia Clausing, had threatened to commit suicide with the shotgun, a 12-gauge Stevens Model 58. Robert McClinchy, according to his family members, had called his son and Peter had raced from his mother’s home on Chichester Avenue–Sharon and Robert have been divorced almost seven years–in an effort to stop him. He did. But, with Peter holding the shotgun by the barrel, according to his attorney, Jim Hogan, it accidentally discharged, leaving him wounded. Robert McClinchy, who police said was “under the influence of alcohol,” was not charged in the incident, He did not return phone calls to his house this week. McClinchy was in the hospital for six days. He missed just seven days of school. Three weeks and three days after the accident, he took a pair of crutches and walked the last mile of the “One-to-One Walk” with amputee athletes Dennis Oehler and Todd Schaffauser. In December, he began throwing a baseball with former Yankees and Mets pitcher Paul Gibson, a graduate of Center Moriches. He taught himself how to compensate for the limited motion in his mechanical knee and learned how to pitch from the stretch. Frustrated when he was sidelined for almost five weeks at the start of the season after he strained his right knee, McClinchy has overcome that setback and done well. Having hit .486 last season as he went 5-1 with a 3.28 ERA with 48 strikeouts and 17 walks in 47 1/3 innings, McClinchy has pitched 6 2/3 innings this season and has a 3.15 ERA. He has struck out five, walked one. He is batting .250 and has thrown 80 mph- and, most remarkable, is still being recruited by an NCAA Division I school, the University of Hartford. Port Jefferson business owner Martin Mandelbaum is helping Haiti native Mana Alexandre get back on her feet, so to speak. Mandelbaum, a certified prosthetist orthotist, is providing his services free of charge to adjust and care for Alexandre’s newly donated prosthetic legs as she learns to walk again. Port Jefferson prosthetist Martin Mandelbaum help Haiti earthquake victim Mana Alexandre adjust to prosthetic legs earlier this month. Photo by Jennifer Choi. Alexandre, 21, was among the thousands injured during the Jan. 12 earthquake in Haiti. While recuperating under a hospital tent in the capital city of Port-au-Prince after having both legs amputated, Alexandre met a couple from Oakdale who were serving as volunteers. Christina Panetta, a physical therapist for 25 years, said she and her husband, Richard, traveled to Haiti in February and volunteered for 65 days. Panetta said the couple became attached to Alexandre while treating her and later learned she had no home to return to when she was well enough to leave the hospital. To help Alexandre receive the medical care she needed, the couple reached out to Congressman Steve Israel and with his help applied for a humanitarian visa to bring the young woman to the United States. “She honestly had no chance in Haiti,” Panetta said, recalling the smell of infection and death that lingered in the streets of Port-au-Prince. Last month, the couple helped Alexandre receive donated prosthetic legs in Florida before bringing her and her 13-month-old son, Wolf, to their Oakdale home. Friday, they joined the young woman in Mandelbaum’s Port Jefferson office where prosthetists have continued to care for her new legs. Mandelbaum, who established his business in the Port Jefferson area in 1986, said amputees go through many changes, especially in the first year, as they heal and adjust to their prosthetics. Little did 17-year-old Marty Mandelbaum know what lay ahead on that Christmas Eve in 1974, when he was heading to work at a stationery and appliance store in lower Manhattan. He was a student at a New York City community college, considering a career in industrial arts education and possibly leading on to an architecture or engineering career. Those dreams were drastically altered when a fire broke out in the store where he worked part-time.Caught in a “back draft” situation — where the flames on the second floor of the building, seeking oxygen, rushed into the elevator as the door opened — Mandelbaum emerged from the store elevator with his hands, upper body, face and arms enveloped in flames. Due to holiday traffic, an ambulance couldn’t get to the store and he had to be taken by police squad car to Bellevue Hospital. In those days there was no burn unit in Manhattan and in addition to his horrible burns, his lungs had collapsed due to the smoke inhalation. He was flown, along with his mother, by army plane to Massachusetts, where he remained for the next two months in the burn unit of Massachusetts General Hospital in Boston. Mandelbaum’s severe burns required many surgeries and skin grafts from several parts of his body, and surgeons were concerned about keeping his hands functional. His situation was so dire that the doctors considered amputating fingers on each hand, but Mandelbaum had other ideas. When he returned home, he used his mother’s hands as models to refashion a half-dozen splints, which occupational therapists had made for him, to correct his deformities. Mandelbaum, who is now a volunteer with the Port Jefferson Fire Department, also had extensive physical therapy to overcome his muscle atrophy. His physical therapist, impressed with his splint redesigning, suggested Mandelbaum look into studying orthotics and prosthetics. Mandelbaum earned his bachelor’s degree in the field in 1979 and this career led him to Long Island — first to Hempstead, then in 1983 to Port Jefferson, where he still practices. Mandelbaum’s work in upper Port includes helping to improve the lives of children and adults who are either missing limbs or need support for weakened or deformed limbs. A tour of his facility shows the huge advances made in this field. Not long ago, the best available fix for a missing hand was a plastic one that was just a model, unable to move at all. Prostheses today allow a person to open and close the hand by contracting muscles in the arm. 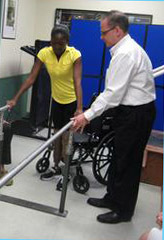 One of Mandelbaum’s cases was a Haitian woman who lost her legs in the 2010 earthquake. The woman held onto her baby throughout the quake, survived and was brought to New York. Mandelbaum’s company fitted her with two prosthetic legs. 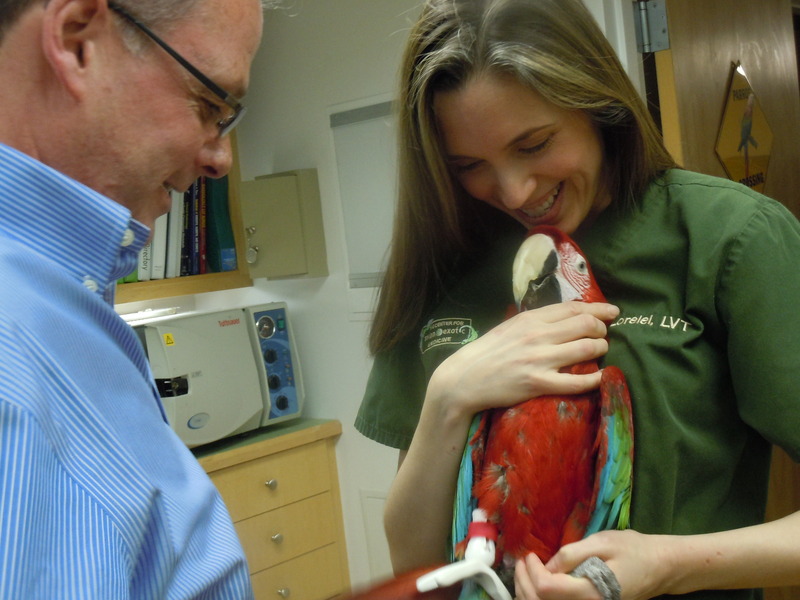 The orthotist’s volunteering has taken him into many new dimensions, including helping animals. 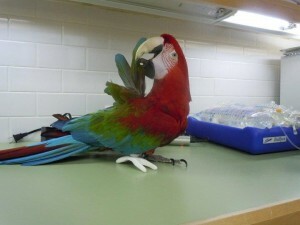 A director from the Avian Center for Exotic Animals in New York City called him after Big Red, a parrot living with an elderly woman, had a leg amputated due to infection. 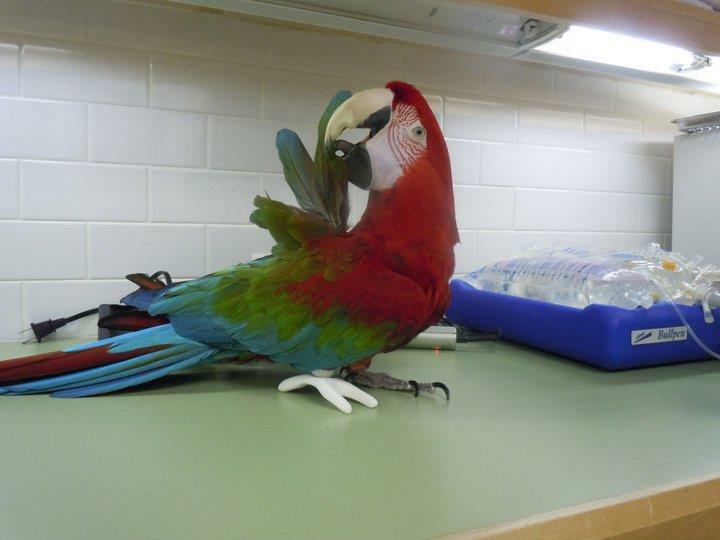 “For a parrot it is detrimental, as she has to stand on one claw while using the other to hold food,” Mandelbaum explained. He devised and built a prosthetic device the bird could stand on. Then there was the case of Polar, a golden retriever puppy whose rear legs were paralyzed, eventually causing an infection that necessitated amputation. The dog was facing euthanization. 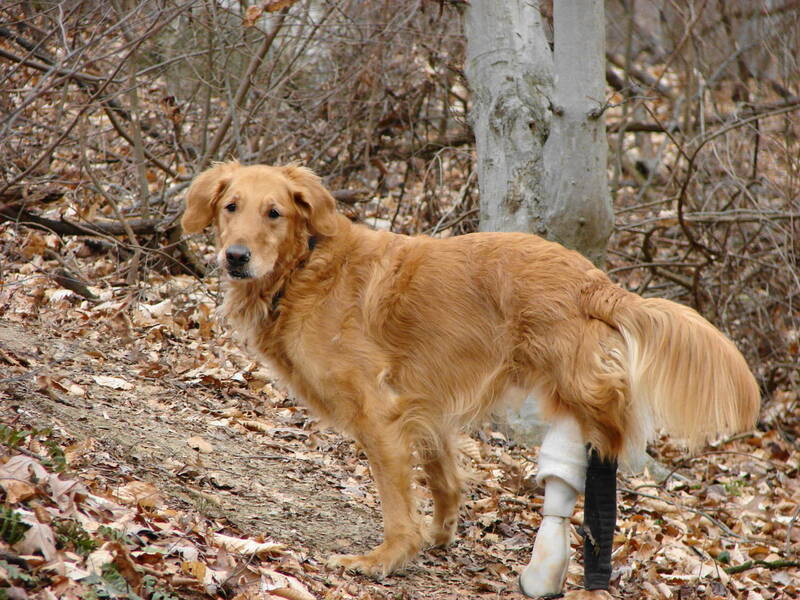 His owner contacted Mandelbaum, who had two temporary and then a permanent prosthetic device made for the dog. The golden retriever then spent his life traveling, serving as an inspirational dog for children. Mandelbaum’s experience recovering from his burns has changed more lives than just his own. 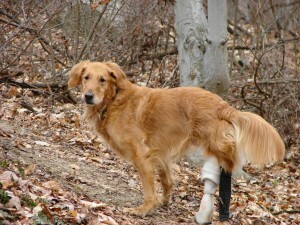 Mandelbaum helped this golden retriever, Polar, after his back legs were paralyzed and required amputation. Marty Mandelbaum discovered his career while recovering from burns as a young man. Marty Mandelbaum, left, with the help of a veterinary technician, takes a look at parrot Big Red.